As it started to rain, I witnessed for the first time since being in South Korea that no one made a move to frantically run for shelter. No one dug into purses or Hello Kitty bags to pull out microscopic plastic umbrellas that somehow unfolded to cover their owners. Instead the large crowd cheered the rain shower on, raising their plastic soju bottles high in the air. 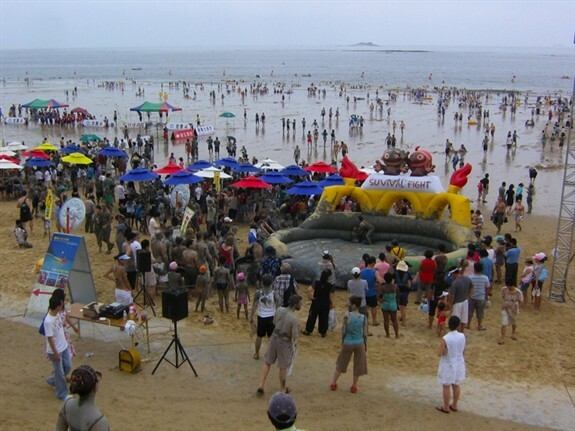 While rain may spoil a parade (or most other type of outdoor event), this July downpour only added to the messy merriment of the Boryeong Mud Festival. 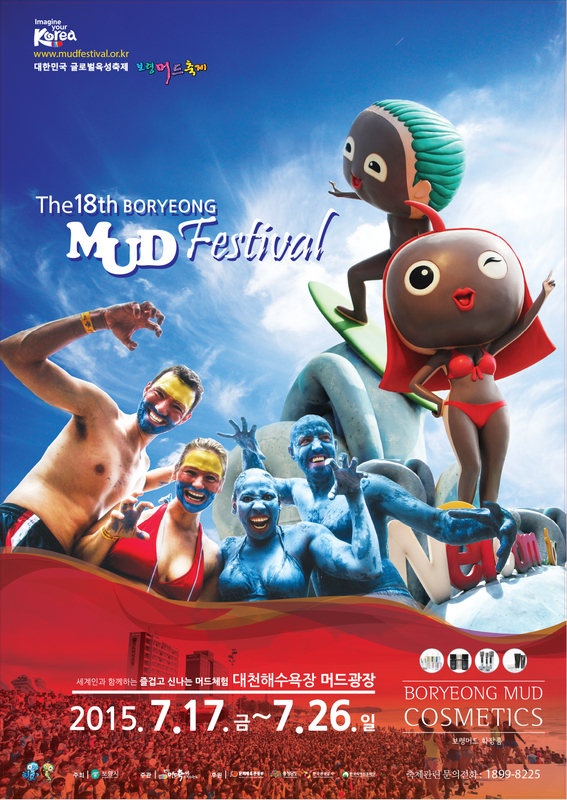 What started in 1998 as a small gathering to promote the health and cosmetic benefits of the special mud found near the town of Boryeong, this nine day festival now attracts more than two million visitors. 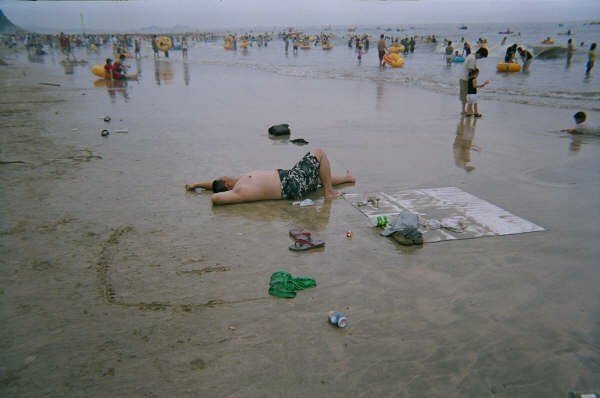 The hub of the festival takes place on Daecheon Beach, known as the ‘Mud Experience Land’. This festival is definitely interactive with a main focus of getting as dirty as you possibly can. In fact, it’s practically a law. Trying to stay muck free will probably land you in mud prison. The crime: cleanliness. The sentence: getting buckets of watery goo poured over you until you are just as slimy and silty as everyone else. 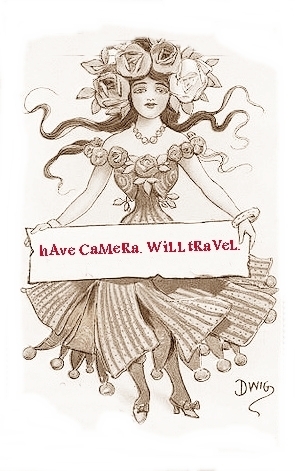 And believe me, snitches are everywhere. 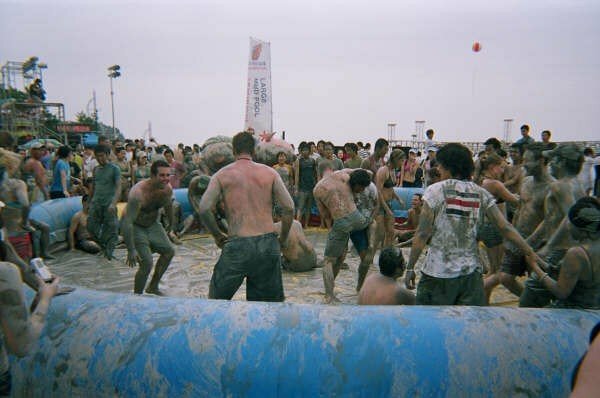 Apart from the jail, the festival offers a wrestling ring, an inflatable slide, a mud pool and a body painting booth-all making sure that you cover yourself head to toe with Korea’s most famous sludge. I wish I would have tried more of these but by the time I got to Daecheon, I was so overtired that I could cry. A group of expats (mostly fellow English teachers) had hired a night bus and I thought it would be an easy way to get to the festival. Lets just say that Karoke and drunk English teachers on a bus are not a good combination; (especially when you are sober and do not do well with lack of sleep). For those of you who were on the bus: yes, yes it was me that hid the microphone. You’re welcome to the others who were not wasted. The beach is long and beautiful (a wonderful place for a nap) and if the sun does come out, not only is the mud that gets caked all over your body a great sun screen, it’s also very good for your skin. Over seven different kinds of cosmetics are made from the pure mud that is found near Daecheon swimming beach and sold all over Korea and increasing so, internationally. Booths selling hair masks, facial treatments, shampoo and soap all made from the mud are available at kiosks near the beach walkway. Massage, acupuncture, and various skin treatments using the mud are also available. There are free showers that can be used to rinse off before entering any of the various restaurants lining the beachfront. Almost all of them are full of seafood that you may have never even known existed. This might be a good time to try Sannakji (octopus that is cut up alive and eaten while still moving) if you dare. Many people accompany this delicacy with soju (Korea’s drink of choice, comparable to Sake or Vodka). K-Pop concerts, fireworks and the usual nightly merriment continue into the wee hours. Tickets: 10,000 Won (around $8 US). From Seoul Central City Bus Terminal, take an express bus to Boryeong (보령). Tips: Don’t take a night bus with drunk English teachers who fancy themselves pop stars. Everything else is pretty much common sense. Prepare to get muddy. 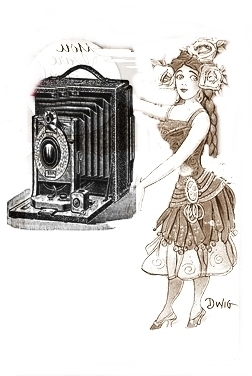 Don’t bring anything too valuable that can get wrecked or misplaced. Let loose and have fun! For photos taken by someone who was not sleep deprived, have a peek at the Boryeong Mud Festival gallery.